"The new Mixim is a compact vehicle that sports a centrally mounted driver's seat with two passenger seats fitted on either side. Targeted towards the youth market, the interior features a computer inspired layout with diamond-shaped cut-outs littering the cabin. 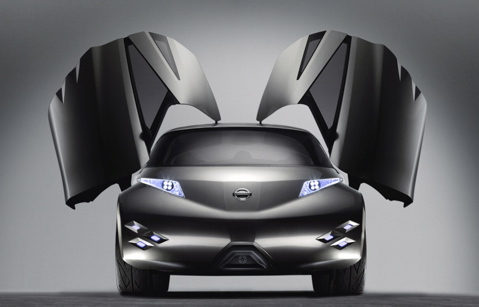 Powering the concept is Nissan's 'Super Motor' electric powertrain running on a compact lithium-ion battery array. The drivetrain features two independent motors, one driving the front axle and the other spinning the rear and in effect gives the car AWD capability. " UPDATE: Nissan just released their second concept car they'll be unveiling at the Frankfurt Auto Show — it's called the Micra Colour Concept +. Yes, it's got a plus sign in the name.